In terms of in-game activities there's nothing new to do, though the time-honoured tradition of snowball-throwing for gifts has received a new incentive since a successful gift proc also awards Command XP for max-level characters, encouraging people to throw snowballs purely for that. It's not something I would want to do for hours on end, but it's a fun little source of entertainment between warzone pops. This time of year is also when SWTOR celebrates its birthday, though that will be the subject of a post of its own. I just thought I'd mention that they actually gifted their long-time subscribers a special stronghold decoration this time. From what I've heard from guildies they've also been decent and gave a bit of leeway to those whose subs may have lapsed briefly at some point due to a credit card expiration or something similar, which is nice. It's just a shame that you can only unlock it once, especially since they sent a copy to every single one of my alts. I do wonder what made them change course so quickly now, especially as the outlined changes will only serve to appease raiders and PvPers - players sticking to solo and smaller group content will still be subject to the Galactic Command gear lottery. These days everyone seems to like disparaging raiders and PvPers as loud minorities that contribute nothing to the bottom line, but this suggests that what Bioware saw happening to these player populations in particular since 5.0 was enough to cause serious concern after all. Either way, I'll take it, play my alts with a clear conscience from now on and fret less about those Galactic Command ranks on my main. Merry Christmas to you too, Bioware. 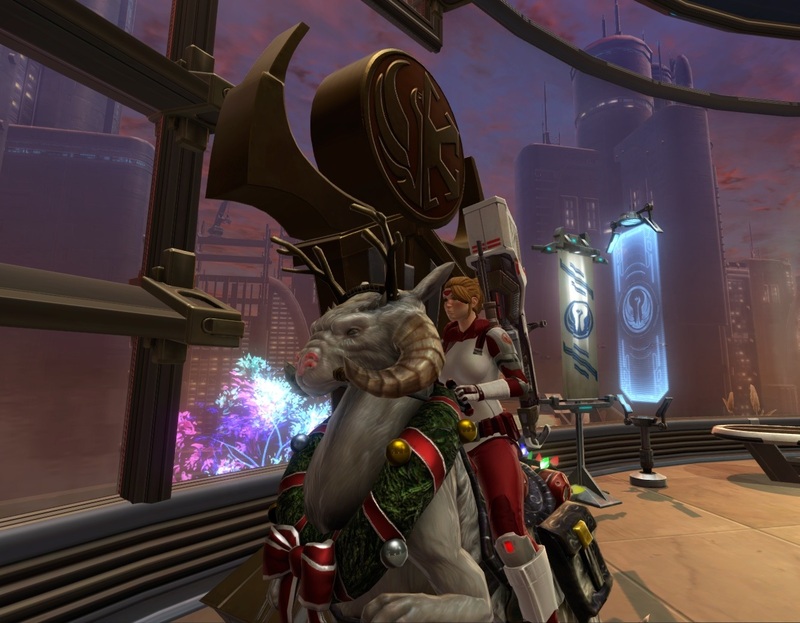 The Festive Tauntaun showed up on the PTS back in November 2013 (http://dulfy.net/2013/11/16/swtor-rakghoul-resurgence-event-coming-soon-new-life-day-items/). It has a red lightbulb of a nose back then, so I imagine copyright infringement was a possible issue. It's hard to believe that was three years ago that seems both so far and so recent game vs real life-wise. The really curious thing is that they apparently haven't made the leeway deliberate. I winged off a polite e-mail the Customer Service Department on Sunday when this was announced because I wasn't sure whether or not I was eligible for the reward due to that gap of (now confirmed) 35 hours sub-lapse; this could have been the first thing I would have actually missed out on since Launch, hence my slight panic. As you know, I received the statue on Tuesday anyway, so I just moved on and thought nothing else. Two days later, however, I received a reply to my initial e-mail. Within, the chap stated that the system had actually detected me as ineligible for the reward, and kindly put forward my case for review (on the assumption that I hadn't received the statue) since he agreed that 35 hours over 5 years is next-to-nothing. I quickly winged off another polite e-mail informing them that this wasn't necessary and outlined the confusion of the automated system's verdict versus what had actually happened. Every time you want to play an alt through KOTFE you need 320 boxes for his alliance, and another 30 to turn in to the Star Fortress companions. Currently the only way to get boxes is to grind heroics at 1 box per heroic. At this point I view heroics as a chore, not a fun activity. It's time to cut down on the number of boxes you need, and possibly have them drop from planetary dailies. At least then I could have some variety from week to week. As someone who hasn't really enjoyed heroics very much since 4.0, I just do C2-N2's weekly mission on all of my alts every week; that saves you a lot of box turn-ins. Also, it's not like you "need" to raise your influence level with the specialists to 20 on every alt. If I don't raise them to 20, I'll feel like a total slacker, so I lose either way. C2-N2's mission could be a good solution if they switched it from Weekly to daily. Right now it would take 40 weeks to fill the bar that way. Well, you being obsessed with filling bars isn't exactly Bioware doing something wrong, is it? :P Are you like that with companion influence as well? And I don't really care about mob tapping rules either way. :) I liked heroics pre-4.0 because they were interesting group content. Now they are just another set of dailies, which I've just never been a huge fan of. My oldest was taunting me about it being Life Day on SWTOR, knowing I'd hate any reference to that blasted Christmas Special.